Bristol based PB Design has installed two inverter systems - rated at 45kVA and 7.5kVA and two PB 4000's, each with one hour battery back up - at the IMAX® Theatre at-Bristol. 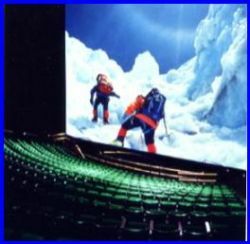 The IMAX® film theatre has the only IMAX® screen in the South West. Its screen is four stories high and fills the audiences vision - putting them right at the heart of the action. Visitors to the theatre can sit amongst 100 000 penguins, swim with whales that are life-size or scale Everest with a daring team of climbers. Exceptional sound and vision give first-hand experience of some of the most dramatic situations on earth. Naturally, the maintenance of a clean continuous power is an imperative part of the installation.